U.S. #644 – is based on an 1821 painting by John Trumbull. On October 17, 1777, British General Burgoyne surrendered at Saratoga – one of the major American victories of the American Revolution. After the first two years of fighting, the British decided to change their strategy. Rather than trying to conquer the New England colonies, they planned to separate them from what they considered to be the more loyal middle and southern colonies. British General John Burgoyne believed New York’s Hudson River Valley was the perfect route for an invasion and developed a three-prong attack. 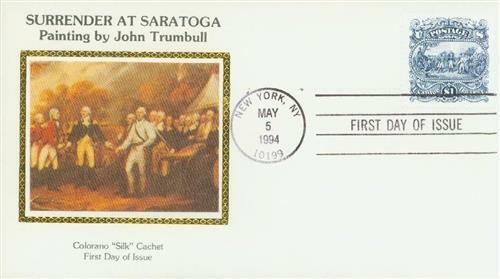 U.S. #2590 FDC – 1994 Saratoga First Day Cover. Burgoyne would lead a large army of about 10,000 British soldiers, Native Americans, loyalists, and others that would travel from Canada through Lake Champlain, down the Hudson River to Albany. There they would establish winter quarters. Colonel Barry St. Leger would lead the second British army through Lake Ontario into eastern New York along the Mohawk River. They would follow the Mohawk to the Hudson River and meet Burgoyne in Albany. The third army, led by General William Howe, was already occupying New York City and would push north along the Hudson, leading the Americans near Albany to believe they were being attacked from the north and south, forcing them to divide. The Americans were not sure what the British plan of attack would be, but did expand military presence throughout New York. U.S. #1728 pictures Burgoyne’s surrender, and Gates’ refusal to accept his sword. Instead, Gates invited his former foe to join him for refreshments in his tent. 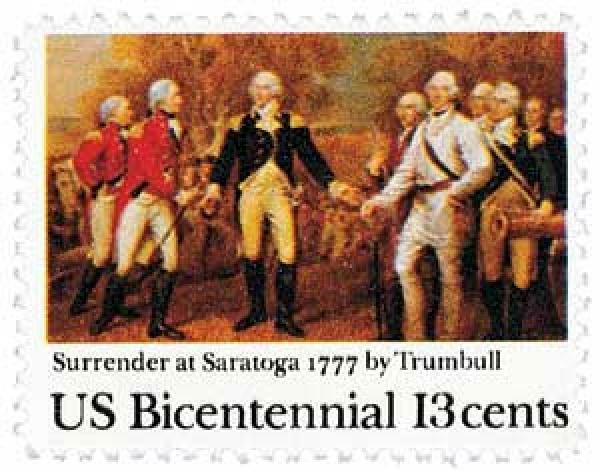 Burgoyne departed Canada on June 13 and by August his forces had captured Fort Ticonderoga and defeated the Americans at Hubbardton, Vermont. But the American victory at the Battle of Bennington cost him 1,000 soldiers and the support of his Native American allies. In September, Burgoyne continued his march south, with his supplies floating down the Hudson on boats. At the same time, Horatio Gates and his American troops began constructing defenses at Bemis Heights, a series of bluffs overlooking the Hudson and the road Burgoyne was marching down. Burgoyne soon discovered that his plan wouldn’t fall into place as he had imagined. St. Leger retreated after the Battle of Oriskany and Howe was still working on his invasion of Philadelphia, so the three-prong attack was down to just his force of about 7,500. Burgoyne split his men into three columns. 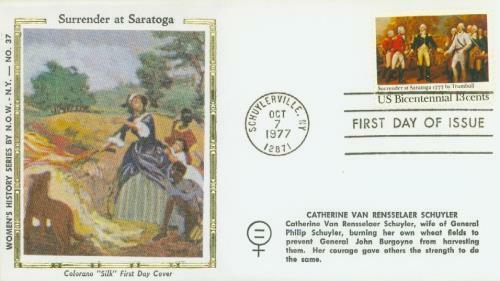 U.S. #1728 FDC – Silk First Day Cover pictures Catherine Van Rensselaer Schuyler burning her crops to prevent them from being harvested by the British. Around noon on September 19, Burgoyne’s center column encountered Colonel Daniel Morgan’s American light infantry at John Freeman’s Farm. The fighting broke out immediately and throughout the course of the afternoon, each side lost and took the field several times. When Burgoyne ordered a detachment of 500 German troops to his aid, the Americans abandoned the field, leaving it in British control. 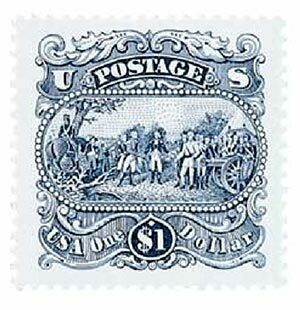 U.S. #2590 is based on an essay that was never used for the 1869 Pictorials. It was engraved by the most renowned stamp engraver of all time, Czeslaw Slania. Days later Burgoyne received word that General Henry Clinton could send additional troops from New York City, so he ordered his men to dig in and wait for their arrival. By early October Clinton had captured a few American forts along the way, but was called back to New York City by General Howe, and unable to assist Burgoyne. As his army grew short on supplies, time and manpower (and now down to 6,800 men), Burgoyne sent out a 1,500-man reconnaissance force to attack the American left on October 7. As the men stopped in Barber Wheatfield to harvest the much-needed food, they were discovered by American troops. The 13,000-man American army attacked and pushed the British troops back to their defensive position at Balcarres Redoubt. Next the Americans surrounded the British Breymann Redoubt, outnumbering them 1,300 to 200. The Americans captured the redoubt by nightfall and now had an advantage. The Breymann Redoubt marked the far right of the British line, so the Americans could flank the British whenever they wanted to. The British quickly fell back to their river fortifications known as the Great Redoubt. With few options, Burgoyne and his men packed whatever supplies they could and quickly retreated north. 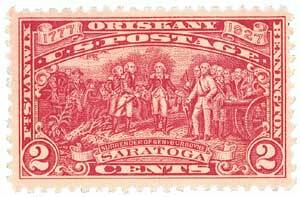 When they reached the village of Saratoga, they found themselves almost entirely surrounded and set up a fortified camp. Within two days they were completely surrounded. Negotiations went on for a week until October 17, when Burgoyne surrendered to Gates. Item #CNNYSND – National Parks quarter picturing the surrender. The surrender was a tremendous victory for America, often considered the turning point of the war. It proved that American troops could battle a European army on their own terms and win. The battle also convinced France, Spain, and the Netherlands to fully support the American cause and declare war against England. The American Revolution was now a world war and the British would see battle in the Caribbean, Mediterranean, North Africa, South Africa, and India. Peace would finally come in 1783 with the signing of the Treaty of Paris, Britain’s recognition of America as a sovereign nation. Click here to learn more about the painting pictured on U.S. #644. Click here to read last year’s discussion about This Day in History. This entry was posted in October 2016, This Day in History. Bookmark the permalink. 7 Responses to "This Day in History… October 17, 1777"
It was at this battle that started Benedict Arnold on his way to becoming a traitor. Military leader in Philadelphia that finally drove him to the British cause. Well said, but as with so many interpretations, credit should be where it is due, and Arnold basically rallied the colonials and won the day, He was a fierce soldier and strongly courageous in battle. Gates was a narcissist and eventually alienated Washington with his egotistical air and inflated opinion of himself. The victory at Saratoga, as you infer, was a pyrrhic one in which was begun the loss of a strong leader of an exceptional caliber. Arnold could have been a great man in history, but instead he remains as the foul traitor he became. A slightly condensed version of Burgoyne’s venture into destruction but my revolutionary 3rd great grandfather Lt Stephen Hoyt was at the surrender of Saratoga. Fantastic, history remember us that Liberty have a price. Thanks, from a South Arkansas lawyer History Buff who reads all that is written as helpful.